An Anna Faris vehicle is different from most star-driven projects in that it tends to inspire pity rather than awe, as in "poor Anna Faris is once again asked to use her comedic gifts to bolster a mediocre script." We don't do this to, say, Emma Stone when she shines in amiable-but-shaky fare. Faris inhabits a curious purgatory within the star spectrum - the Faris Zone - where she is too sharp to play the daffy blonde over and over but considered too infantile to move any further up the rom-com pecking order. (Part of this is, of course, the lingering assumpion that the woman need only handle the "romance" side of the equation and leave most of the funny to her male costar.) 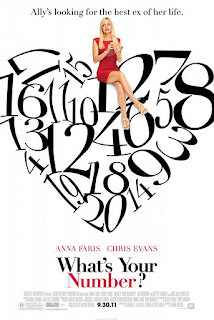 So of course there's no way to watch her navigate the regressive gender panic of What's Your Number? with anything except a weary compassion for "poor Anna Faris." 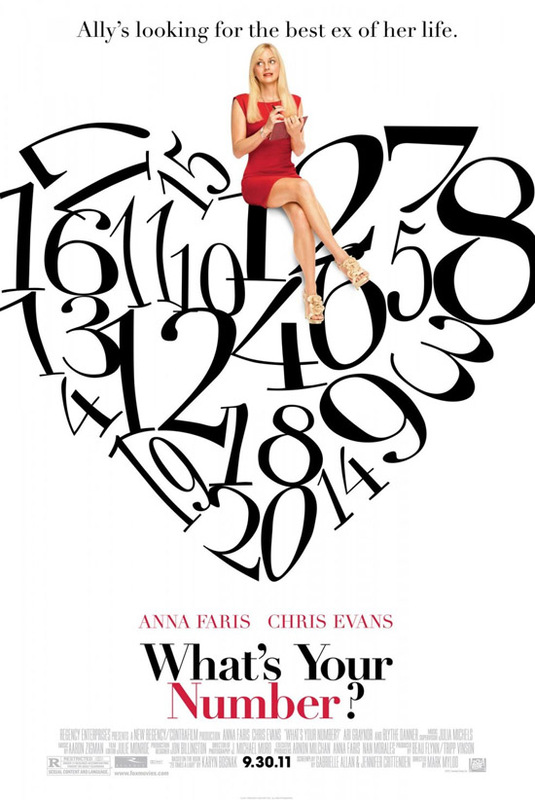 The movie introduces Faris as a single woman in personal and professional crisis mode, exacerbated by a magazine article claiming that a woman's probability of getting married plummets if she's had more than 20 sexual partners. Tallying her conquests at 19, Faris swears celibacy until she meets Mr. Right then promptly notches her 20th after a chance encounter with the boss (Joel McHale) who fired her at the beginning of the film. Her chastity now dictated by the ironclad science of women's magazine research, she begins a frantic inventory of all her ex-boyfriends to see if any of them have ripened into marriage material. Aiding her search is hunky next-door neighbor Chris Evans who "comes from a family of cops" and therefore possesses the requisite sluething skills. There isn't a whole lot standing in the way of the inevtiable coupling of Evans and Faris. Their courtship is fun and playful and even they quickly realize that they like each other a lot, which makes the traditional third act breakup seem especially contrived. It is refreshing, though, to see Faris wear the comedy pants in a relationship. By sheer force of personality she helps What's Your Number? retain a progressive veneer. The character's diverse, if checkered, dating history is enhanced by Faris' loopy charisma, making her quest seem more like proof of her impressively broad appeal in the dating pool than the indiscriminate act of a desperate woman. She's too cool and too unapologetic to have a conventional ending to her story. Too bad the movie requires her to act like she should.